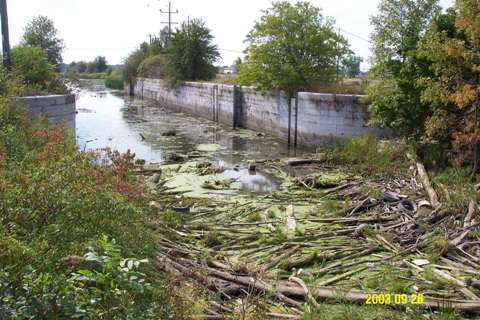 Port Maitland Lock to get a Spring Cleanup - Needs Volunteers! With spring upon us, it is time to remind you of a major cleanup scheduled for Saturday May 1st at the Port Maitland Lock in Port Maitland. We need help! Lots of help! Much of this spring's cleanup will take place in the water, which means we need people willing and properly equipped. As mentioned in earlier articles, the Port Maitland Lock is the only original visibly remaining lock from the Welland Canal feeder system. Another lock which to my understanding is in very good condition lies below Main St. in front of the A&P store in Dunnville. 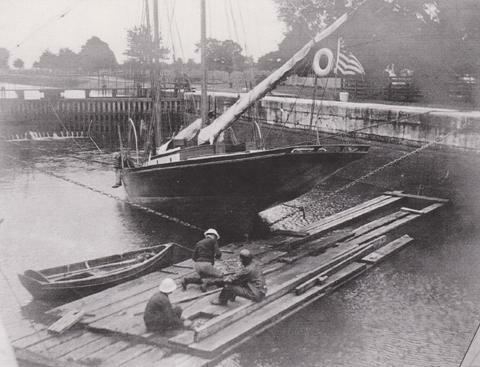 In newspaper articles during 1904, when the Port Maitland Lock was rebuilt, it was described as one of the finest locks on the Welland Canal. 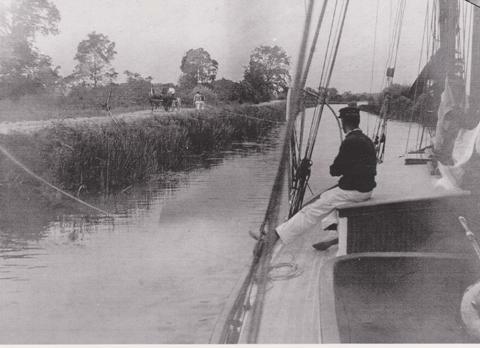 There has for some time been disagreement over when the Feeder Canal was last used. I am still not able to give an exact date, but I suggest the year was 1923, when the nine-foot cement road from Dunnville to Stromness was built on the heel-path side of the feeder. This road went from approximately Taylor Road in Dunnville to the swing bridge (Bridge # 2) in Stromness. At intervals of no more than 1,200 feet the cement was widened to 18 feet allowing for a passing area. Sand and gravel used in this cement was hauled off the beach at Port Maitland on the Beckley Beach side, and transported in barges to work sites along the Feeder. I have written about Harry Siddall injuring his leg in the lock during this construction, and I am also aware Mait Cudney was injured in the lock in a similar accident during this same period. The Port Maitland Lock was built by John L. Brown, a historic engineer who built not only the Mohawk Island lighthouse, he also built lighthouses known as the Imperial Towers at Point Clarke, Cove Island, Griffith Island, Natawawsaga Island, Christian Island, and Chantry Island. The lighthouse which still stands at Beach Boulevard, under the James N. Allan Skyway in Hamilton, was another of his many marine related construction projects. This only remaining visible lock from the feeder system deserves better than what it has received these past eighty years. Last October, with the help of a few volunteers and George Barnes and Sons Excavating, some of this respect is being realized. In October 2002, I sent a letter to former Mayor Lorraine Bergstrand, asking her to bring the County onboard with me and cleanup the Port Maitland Lock. Mayor Bergstrand, council, and staff, began that process. Now our new Mayor, Marie Trainer, along with others on council have given first-rate support to this project. However, as I had wished from the beginning, it is a volunteer's project. Volunteers need to clean out most of the brush and debris before we can expect the County to step too deeply into the project. I have a dream, which to my pleasant surprise is shared by many others. It is hoped that someday we will clean out the waterway between the two fill bridges and restore this area to something of a park like setting. It has come to my attention others wish to take my dream a step further. I understand there is a desire to rebuild the gates. Not to restore the lock to working condition, but to bring it back to visual correctness. What a great idea, and once I see some serious headway on early phases of this cleanup, I will be onboard to help in any way I can to see the gates restored. It is also one of my wishes to build an information kiosk to provide a good text and visual history of the lock, the Mohawk Island lighthouse, and the Grand River Naval Depot. Landscaping and period lighting are also on that list, as is restoring a proper water level to the area between the fill bridges. We need help on Saturday May 1st from people who are willing and prepared to step into the currently very dirty and uninviting water of the lock. You will be asked to pull logs, tires, propane tanks and who know what else from the water. George Barnes and Sons have agreed to once again provide manpower and equipment. We will also need help on the banks and along both aprons from people with rakes, lawn mowers etc., and strong backs. Finding volunteers has been slow, but not disheartening. John Brunskill of the Dunnville Hunters and Anglers, when I asked for their assistance told me, "I will bring a BBQ and cook hotdogs for the volunteers." I took him up on it! Let's hope John has to cook a lot of hotdogs! Take a drive through Stromness and head for Port Maitland. You will find the Port Maitland Lock at the end of Rymal Road, just as you reach the feeder canal. Get out of you car and look down into the lock. Think not of what you see now, but rather what you will see after much cleaning has been done! Then go home and give me a call offering to volunteer your assistance and ideas.